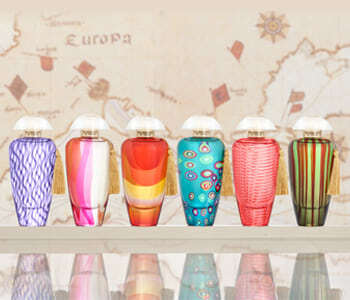 The Merchant of Venice Murano Collection depicts the magical journey between the beauty of the orient and the attraction of Venice, a tale of pure exquisiteness for women in fragrance form. Personifying the spicy aromas and refined essences of the Mediterranean route, this exuberant perfume collection embodies the precious selection of refined treasures found along the way. A journey of a dream, the masterful proficiency behind each lavish The Merchant of Venice Murano Collection scent enchants and inspires its wearer, whilst honouring the alluring beauty of the picturesque city of Venice.